Cassava, originally from Brazil, is a staple root crop throughout the tropics where it is used in a variety of dishes. Cassava is grown overwhelmingly for its roots and is found in markets throughout the country where immigrants from tropical regions of the world shop (Figure1). Cassava was grown in Florida for the Cuban and other populations that started to arrive in the 50’s. There were an estimated 1,000 acres of cassava being grown in Florida during the 60’s, 70, and 80’s, but has fallen off precipitously; there were less than 30 acres in production in 2013 (Lamberts, 2013; see references below). Cassava imports from mostly countries in the tropical Americans have increased greatly over time as immigrants from tropical regions of the world have come to the United States. Cassava roots are considered ready for harvest after 9 – 12 months after planting (Lamberts and Olson, 2013); since cassava is killed with a hard frost, cassava cannot be grown in the Northeastern United States. Cassava was evaluated at the UMass Farm in Deerfield in 2005 and harvested shortly before frost and the roots were not close to marketable (Figure 2) (Figure 3). 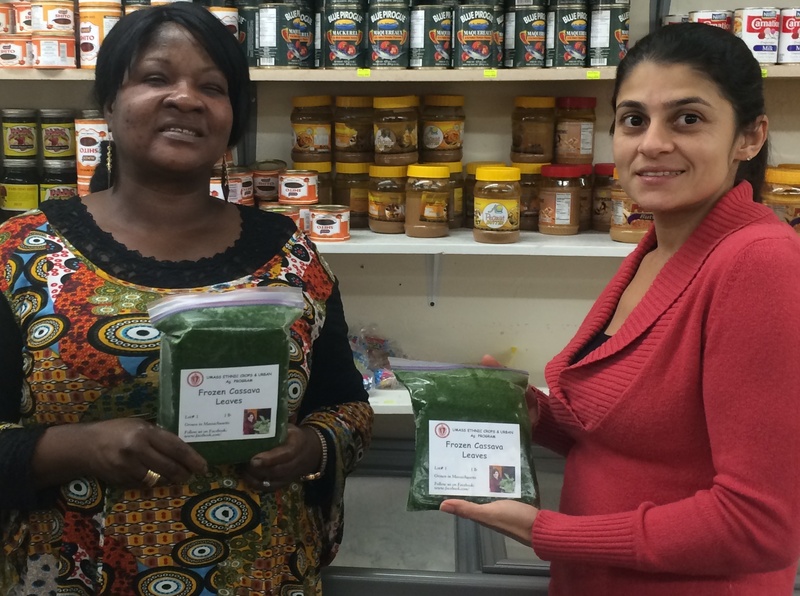 In some countries there is a market for cassava leaves, which includes Liberia, where it is used in soups and stews. 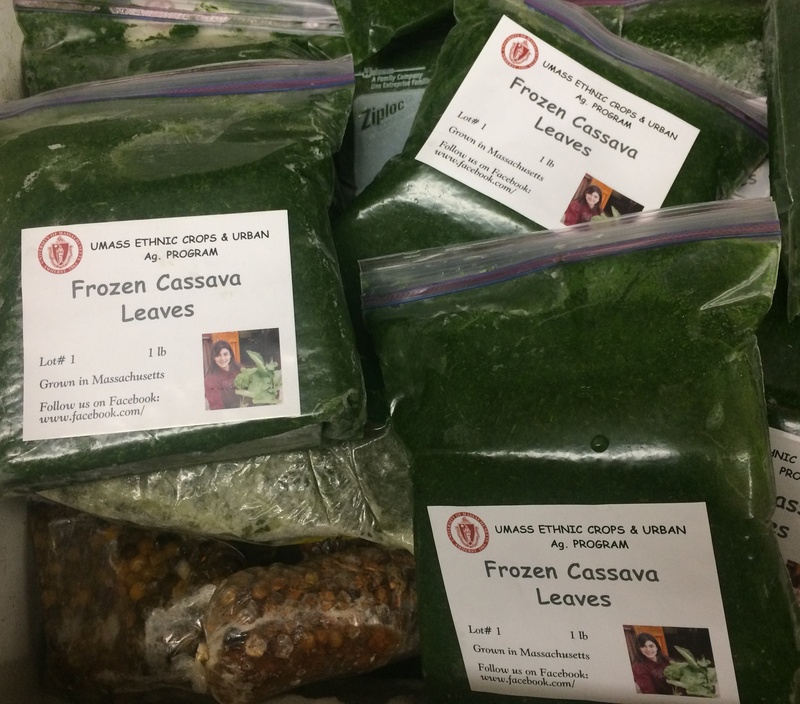 Markets in Massachusetts that cater to Liberians will carry frozen cassava leaves (Figure 4). Cassava contains cyanide, which varies greatly among cultivars, and needs to be detoxified before human consumption. Cassava roots are cooked and this will sufficiently detoxify them. Cassava leaves also contain cyanide and research has shown that traditional methods for preparing cassava leaves for consumption, that include grinding, cooking and heat-treating them before consumption sufficiently detoxify the cyanide ( Aduni, U.A., et al., 2008). Cassava is normally propagated by planting segments of the stem of a mature plant, called sticks or stem cuttings. When we grew cassava at the UMass Research in 2005 and 2014 we got the stem segments from ECHO http://echonet.org. We did contact University of Florida Extension (http://miami-dade.ifas.ufl.edu/) and asked for recommendations for cassava stems. They said many garden centers in their region sell them, but the ones we contacted were out of stock. We wanted ours to start in a greenhouse in ealry April or March and people start them in their gardens in Florida at other times of the season. We started our stem cuttings in a greenhouse on April 7 in 2005 (Figure 5) and April 1 in 2014 (Figure 6). The transplants were put into the soil in early June. 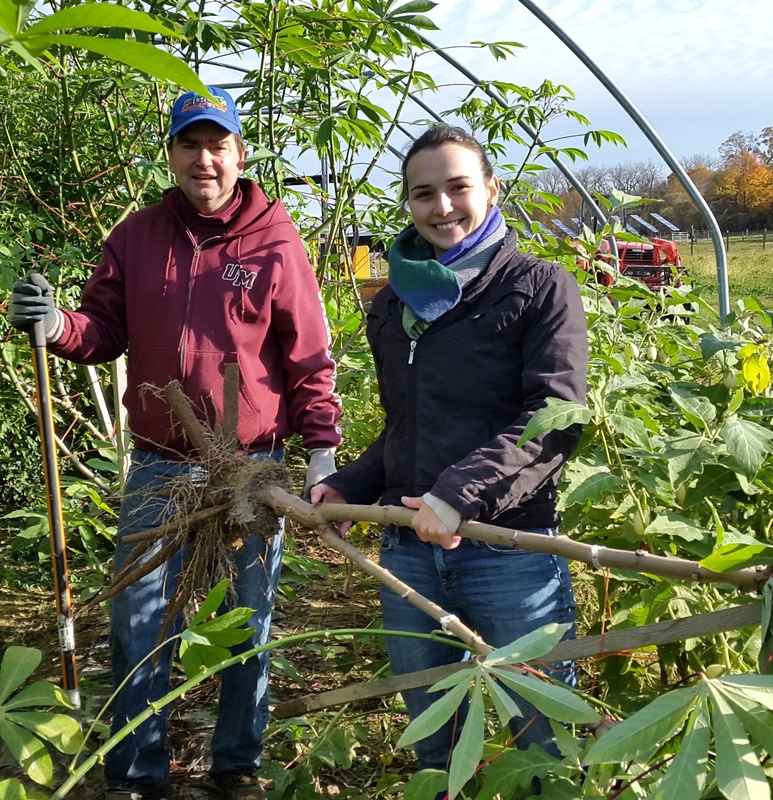 In 2005, they were transplanted outside and in 2014 they were transplanted into a high tunnel (unheated greenhouse), both at the UMass Research Farm in Deerfield Mass. In 2005, the plants were harvested on September 9 (Figure 7) (Figure 8)and October 14 in 2014 (Figure 9). Both years we grew cassava at our research farm we got the stem segments from ECHO http://echonet.org. 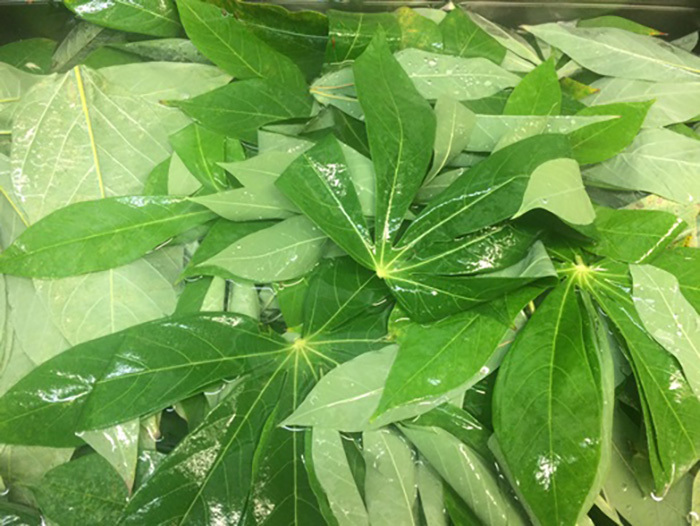 The focus of our work was to evaluate cassava leaves and not the roots, which cannot be produced viably in Massachusetts, even in a high tunnel. We canvassed African markets and we were told that they did not want fresh cassava leaves; instead they wanted them ground, water added to them, and then frozen. All African markets we visited in Massachsuetts had frozen cassava leaves for sale (Figure 10). We harvested the cassava leaves, washed them (Figure 11), ground them (Figure 12) (Figure 13), added water and then froze them (Figure 14). African markets we brought the locally-grown cassava leaves were happy with our quality (Figure 15). Lamberst, M.L and S.M. Olson. 2013. Tropical Root Crop Production in Florida. HS710, Horticultural Sciences Dept. UF/IFAS, Fla. Coop. Ext. Serv. Chapter 24.